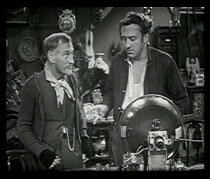 This page contains a complete listing of all the Steptoe episodes broadcast in the Uk and their original broadcast date. If you would like to know more about a particular episode then simply click the review link, If the episode does not have a review then why not help us out by writing a review of your own. Even if your favorite episode already has a review please still submit one. It is far better to have as many diverse views as possible, so all contributions will be gratefully received, as the vicar would say! Is That Your Horse Outside ? Steptoe and Son - and Son !